b. Those outside the region. 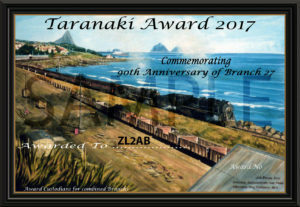 The Wooden Trophy to be awarded to the outside the Taranaki region station who has the most contacts with Taranaki stations. The Taranaki station contacted can only be used for scoring once, regardless of what bands they are contacted on. The Trophy is to be held by winner for 12 months.